"The obvious question about my pictures is the one everybody asks: why are they upside-down? The question is answerable , but it doesn't really lead to what I do. 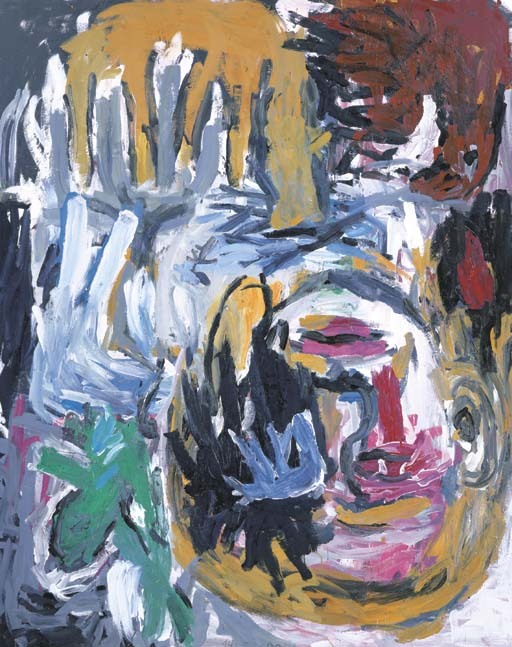 What interests me is the position that I take up when I move right away from people's heads" (Baselitz quoted in an interview with Walter Grasskamp, 1984, cited in Georg Baselitz, Cologne, 1990, p. 28). Painted in 1986, Hirtenkopf (Shepherd's head) is a work in which, as its title reveals, Baselitz revisits the subject matter of his celebrated series from 1965 known as the Heroes, New Types or Partisans. The figure of the shepherd, the peasant or a simple artisan had been the central character in this groundbreaking series. In Baselitz's later paintings however, the subject matter - which was crucial to these works - became of far less importance to the artist. It merely served as a prop or a model that enabled Baselitz to paint. To demonstrably make this function of the subject matter clear Baselitz began inverting the images of his paintings from 1969 onwards. Such subversion through inversion has come be a distinguishing feature of all the artist's later work and was the ultimate solution to an increasing tendency in the artist's work in the late 1960s of allowing his subjects to "wander" all over the canvas. As the artist pointed out in an interview with P.M. Pickshaus in 1990, "If you stop fabricating motifs but still want to carry on painting, then inverting the motif is the obvious thing to do. The hierarchy which has the sky at the top and the earth at the bottom is, in any case, only a convention. We have got used to it, but we don't have to believe in it. What I wanted was quite simply to find a way of making pictures, perhaps with a new sense of detachment. That's all. If the motif is drained of all content - whatever kind of content it may be - then I can paint anything. That was the point of the inversion. And that's what I did." (Baselitz cited in Ibid, p. 29). What Baselitz creates in a work such as Hirtenkopf therefore, is a kind of anti-picture, a figurative work that is in reality, predominantly an abstraction. The inversion of its subject allows for the means of the painting - the rich physicality of the artist's bold brushstrokes and his incisive and predominantly constructive splashes of color - to take on a dominant role in the work that expresses and records the process of the artist's struggle. In contrast, the subject matter of the painting, - the source of the painterly act - recedes into the background as if it were a mere structure which Baselitz seems to want to both affirm and destroy.